April 6, 2014 (Tony Cartalucci - NEO) - The roof of a house is composed of many shingles providing protection to those beneath it. For the global corporatocracy, these shingles are composed of several types – their media monopoly and the narratives they spin, monopolies over economics, infrastructure, and the use of force, and Western-style “democracy” where in the people are granted the illusion of self-determination in place of true freedom and control over one’s destiny. If upon one’s roof, even a single shingle is lifted up, it poses the danger of allowing a gust of wind to tear off others, and perhaps even the entire roof. While the singles of Western media spin are being torn off one after another amid their coverage of conflicts in Libya, Syria, and now Ukraine, the shingles of so-called Western-style “democracy” are being lifted up in Southeast Asia’s Thailand. By understanding and bringing attention to the unraveling “democratic” facade in Thailand, it may be possible to defeat Western meddling elsewhere around the world. 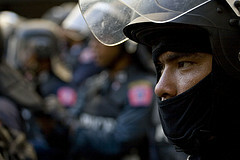 While the United States poses as the preeminent champion for global human rights and democracy, it has been a stalwart supporter of the current Thai regime led by Thaksin Shinawatra – a billionaire autocrat whose monopoly over Thai politics has led to the selling out of Thailand’s resources and infrastructure to foreign corporations, unprecedented human rights abuses including the mass murder of some 3,000 people in a so-called “War on Drugs,” and the intimidation, kidnapping and/or assassination of his political enemies. In other words, Thaksin Shinawatra represents the antithesis of what the West, and the United States in particular, claims to stand for. Their use of these principles and the facade of “democracy” to perpetuate Thaksin Shinawatra’s grip on Thai politics reveals the true purpose of what could be considered the West’s “democracy racket.” It is a veil behind which the West advances its otherwise unpalatable agenda. Despite Thaksin Shinawatra’s demonstrably destructive policies and his autocratic, brutal style of dictatorship – when his overtly criminal actions were ever called into question, he simply held “elections” to give himself a renewed mandate to remain in office. His success at the polls was due to his iron grip on Thailand’s populous, but sorely undeveloped rural northeast region. An array of government subsidies, cheap loans, literal cash handouts, and a Tammany Hall-style political machine ensured not only victory after victory at the polls, but a growing sense of political and legal impunity. While such an arrangement clearly undermines the basic principles of elected representative governance, the West has ignored what amounted to institutionalized vote-buying and has continuously reiterated that Thaksin’s political success is simply “democracy” in action. Thaksin Shinawatra owes his significant backing from the West partly to his ties to Wall Street’s corporate-financier elite stretching back to the late 1990′s when he served as an adviser to the notorious private equity firm, the Carlyle Group. It is also owed to his servile obedience to Western ambitions both regarding Thailand and Thailand’s support of the West’s global interests. When Thaksin first took office in 2001, his privatization of Thailand’s nationalized oil and natural gas giant, PTT invited in Western oil giants like Chevron and Hess to begin siphoning off billions. Next, he moved to aggressively push through free trade agreements (FTAs) with Australia, China, and the US. Thaksin was finally removed from office via a 2006 bloodless military coup. He has struggled to remain in power through a series of proxy regimes who, like his administration from 2001-2006, have relied entirely on his northeast political machine and the illusion of popular support via “democracy.” Currently, Thaksin’s sister is standing in for him as prime minister, while he lives abroad evading a 2 year jail sentence, 2 arrest warrants, and a long list of pending legal cases.